Pontoon boat design has evolved dramatically over the years from when it was first conceived. Although the idea of using pontoon structures for transportation has been around for thousands of years (the Greek Homer described the use of pontoon floating bridges around 800 BC), the ancient Polynesians were among the first to take the pontoon from a floating bridge to a small vessel and head out to sea. They realized that making a boat supported by two logs tied together reduced the risk of capsizing while they were out in the ocean. By taking time to hollow out the logs, the buoyancy of their raft (or pontoon) was increased, and the vessel became more stable. Their early multi-hull pontoon designs were partly what inspired the modern day sailing catamaran, as well as the power-driven pontoon boat. There is some controversy as to who invented the first official pontoon boat, although generally it is attributed to Ambrose Weeres in 1951. Living in ‘The Land of Ten Thousand Lakes’, he was interested in engineering a boat that would be more stable for heading out for a day on the lake. He was a small time farmer in Minnesota, who with the help of a few friends attached two steel barrels to a wooden platform: thus constructing the first official pontoon boat. Weeres designed the pontoons to have an upturned forward nose cone, as well as a small outboard motor to power the vessel. It was quite ingenious how he designed the steering system. He attached a vertical stick at the bow of the boat, which was connected by two lines to the outboard at the stern. If he wanted to turn left, he would pull the stick to the left and the opposite if he wanted to turn right. Keeping the stick in an upright position would maintain a straight course. Weeres called the first pontoon boat model The Empress, and soon had a stack of orders from fellow Minnesotans who had seen his boat cruising out on the water. It was like nothing anyone had even seen before. All the previous boats on the market were narrow, tippy, and quite small. Seeing a boat that was extremely stable and wide was something totally new. And with such a high deck, it was as if a moving platform had suddenly become a boat, and the boater no longer had to worry about waves crashing inside his boat and swamping or overturning his vessel. Minnesotans wanted more of them, and so he started Weeres Pontoon. This was the first pontoon company to be created, yet he couldn’t keep up with the orders flooding in. His company is still in business today, and has built more than 30,000 pontoon boats during the history of the company! Weeres was soon known as ‘Mr. Pontoon’, and in 1991 was elected to the Minnesota Marine hall of fame for his contributions to boating history. But he didn’t stop with just The Empress; Weeres realized that steel pontoons tended to collapse when they flexed during cold temperatures (a common occurrence in Minnesota), so he redesigned the pontoons to include a vent tube in each one. These tubes in the actual pontoons would flex with the fluctuations in temperature, without twisting the outer pontoon structure. His company would also be the first to use pressure treated plywood in their boats, as well as eventually constructing the pontoons out of aluminum, instead of steel. Even when other pontoon companies were building similar vessels, Weeres company continued to lead the marketplace with innovation and design. In 1992, they increased production as a result of selling their boats in a package deal: boat, trailer and a motor for one group price. In 2000 they were named the ‘Best-Built Luxury Pontoon’ by Pontoon and Deck Boat Magazine, and they began to expand their line to include fishing, swimming, waterskiing, and even large cruising pontoon boats from sixteen to twenty-eight feet long. Although Weeres is credited with the first pontoon, Harris FloteBote has been around for almost as long, and has made several vital improvements on the pontoon field. It was started in 1957 by Ernie and Pete Harris in Ft. Wayne, Indiana. They started the company after testing their pontoon designs in surrounding area lakes around the early 1950’s, and were met with such positive support they decided to open their own company and market the design to the public. They had originally come up with the idea from seeing other boaters building pontoon style boats with 55 gallon barrels and tanks from planes, and thought that might be a marketable idea. However, they wanted a more engineered and sleeker vessel. They built a motor mount on the boat so the motor could be raised up or down. They also discarded the airplane tanks by creating actual pontoons made of steel, although they were flat-nosed. As interesting and useful as these first pontoons were, it was a hard sell to the local boat dealers. They simply took up too much space in their showrooms. So the brothers begun going door to door to potential customers to talk about their new boat design. They would drive around the lake, and stop at random yards and ask if people wanted to go for a ride. It was the best way to get a potential customer out on the water. Once they had taken a ride, it was an easy sell. They continued to update and revamp their pontoon designs as the target market desired. In the 1960’s, they began installing upholstered pontoon furniture and seats on all their pontoon boats. 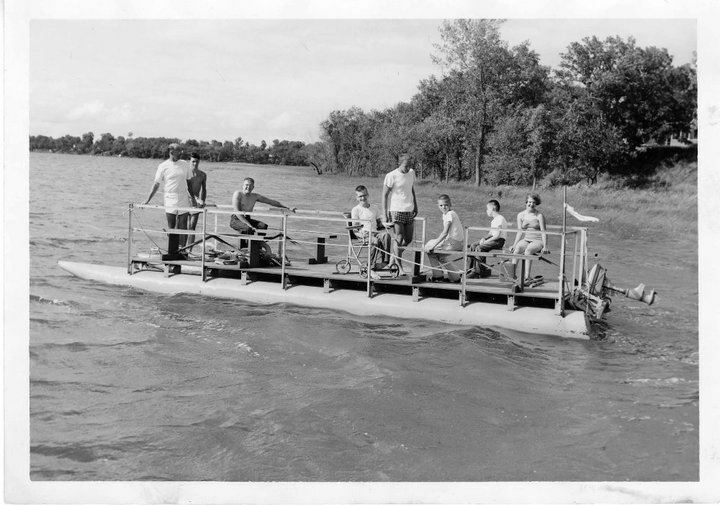 But overall pontoon design and usability has significantly changed over the past 60 years as well. In the 1980’s, pontoons started to attract many young families to the market. As the boats were becoming increasingly affordable, as well as being easy to trailer and store, people who wanted to take their families out on the water finally had the space in a vessel without it being overly extravagant or expensive. But it’s not only the ability to trailer a pontoon vessel which makes them so attractive yet stay within reach of many individuals; there are a multitude of other aspects of a pontoon which give them a distinct edge in the boating world. They have a very large floor plan, giving the boats abundant space for numerous deck and lounge chairs, tables, storage areas, as well as just having the room to walk around without getting in each other’s way. Modern day pontoons also have a larger tube diameter, which allows for them to be equipped with new, higher performing engines. This gives them the same power and maneuverability that similar-sized v-hull boats have always had. Not only that, but having the extra floor space that is standard on a pontoon vessel, modern day pontoons can accommodate toilets, changing rooms, fish finders, various enclosed cabins, aerated live wells for fishing convenience, as well as coolers and mini-kitchens. Weeres Pontoons is not the only pontoon manufacturer in the market today, and many of the different companies have improved upon his initial design and made their own specific modifications. Most of the ‘radical’ designs are showcased in each company’s high performance model of pontoon. These pontoons are generally designed with an additional third pontoon, or at the very least larger diameter pontoons. Many of the models also have under deck skins, which decrease drag between the pontoons and the floor structure, as well as having specially shaped pontoons. Lifting strakes also seem to be very popular, which attached on either side of a specific pontoon increase overall buoyancy. This tends to make turning easier and increases the general performance of the vessel. Bennington Marine has a high performance pontoon boat that comes with the ESP (elliptical sports package) package. They have reengineered the basic hull design by adding a center or third pontoon, as well as increasing the size of the third pontoon to 32 inches in diameter. They have added lifting strakes on the extra pontoon, which increases the handling and turning of the boat while underway. Their pontoons are also designed with solid keels, and the under deck structure comes complete with a wave shield, thus decreasing drag while at speed. Hydraulic steering further assists in its high performance capabilities, allowing it to come with a choice of outboard motors up to 150 horsepower (hp). Premier also has designed a pontoon that comes with their PTX performance package. They opted for an added third pontoon as well, which is larger than the other two. This results in more water displaced, thus increasing buoyancy, resulting in a flatter planing surface while at high speeds. They have installed lifting strakes on the outer pontoons, as well as hydraulic steering to make it easier to handle that extra maneuverability achieved from the increased turning radius. Manitou is another big name out on the market, and they have evolved the pontoon by engineering their own specific fiberglass pontoon hull shape called the V-Toon. Manitou reconfigured the standard v-boat style hull shape and applied the design to its specific models of pontoons. Their center tube is 5.25 inches deeper than the surrounding pontoons, and positive lifting strakes are installed on each side. The hull shape allows for smooth banking while the vessel is making sharp turns at speed. This design allows for a combination of outboard motors up to 300 hp. PlayCraft has manufactured and patented the PowerToon design for their high performance model. They also have installed a third pontoon, but this one is set further aft than the other two. This feature guarantees a smooth flow of water down the structure to the propellers, thus giving the model more power while underway. They attached a smooth under layer along the length of the hull, which further assists in helping water flow between the pontoons: reducing drag. Lifting strakes help the boat reach plane faster, as well as giving the model excellent stability and maneuverability while at high speeds. Harris FloteBote has a PIII Performance Package on several of their models. They have added the center pontoon, all of which are 25 inches in diameter, with the center pontoon an inch lower than the other two. This produces a v-hull effect, found on traditional boats. Lifting strakes are added, thus increasing overall performance. Not only is the design geared towards high performance, but the additional options of the vessel are top of the line. A touch-screen helm display is available, as well as a GPS-based cruise control. These boats are built for maximum comfort while achieving top performance. SouthBay has introduced a trifecta package out on the market, which is their adaptation of the high performance pontoon boat. They have a full center tube, lifting strakes, and have lengthened the nose cones on each pontoon to enhance the overall speed. To assist with these added features, hydraulic steering is a standard feature with the trifecta package. Pontoon boat makes and models do not only come in a standard package, but you can basically build your own pontoon boat from the pontoon up, with many easy to use options and accessories available on several pontoon company websites. You can choose the specific layout of your vessel and what texture of fabric for all your lounge chairs. You can decide exactly how many coolers you want, where the ladder is located, if there is a tow bar installed or how many biminis will be added to provide shade (and in what color). You can decide exactly what hp you need on your pontoon boat, and which model outboards will help you get to that desired speed. You can also design what the outside of your pontoon boat looks like: what color or specific designs will be adhered to the fiberglass walls, or if you want to design your own special ‘one of a kind’ look. And as if the basic look of the pontoon isn’t enough, you can modify the sound system to play your own concert out on the water (just about), and even add lighting effects to make other boat owners jealous. They definitely have evolved above and beyond Weeres original steel and wood pontoon boat design.